Today's digitally savvy consumer (read as mobile powered) is looking for solutions 24/7, 365. 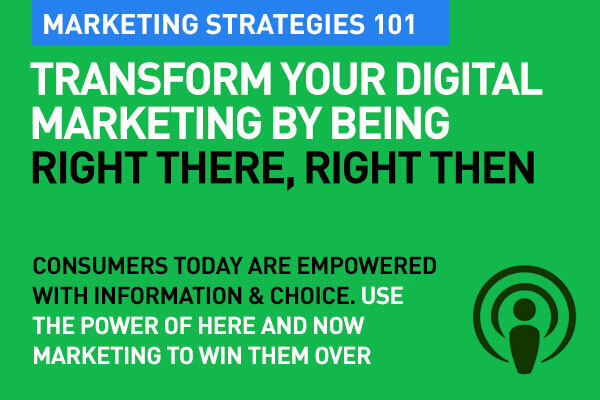 Brands can transform their digital marketing by being 'Right There, Right Then' with their message to win them over. When a consumer wants to know something, wants to go somewhere (on a holiday, to a restaurant, to a business location), wants to do something and wants to buy something, they need to connect with the brands that have solutions right away. Simply put, these are the four basic need states that digital marketing needs to answer. And answer quickly and effectively. By being 'Right There, Right Then'. Today's marketing needs to be in the here and now. It is about intent, and the answer to that intent needs to be there right away. Today's audience is starved of time, and have very little attention. Brands need to adopt the following five 'experiential' forces to transform their digital marketing. Today brands need to have a well synchronized multi channel strategy. In our world of Always On, it's important to be across all consumer touch points (including all offline) to lead the consumer towards becoming a customer. The process of learn, discover, research, socialize and buy is best optimized to be seamless and uniform. You can't transform your digital marketing unless it is founded on a one brand many channel strategy. Brands today need to have content to meet the demands of the consumer – in many forms. But what's critical is context. Consumer behavior is changing because of what mobile uniquely allows them to do – to find most answers when they need it, around where they are. Mobile's geo location technology empowers consumers more than ever. Brands need to focus on local first, specially those in retail. Mass marketing is fading fast to micro marketing where products and experiences that are created to treat customers individually—along with personalized marketing treatments—are what's winning the marketing battle. You really need to know your audience, and their intentions. Audience insight is your first key step. Insight is what transforms your digital marketing. Today, it's absolutely essential for a brand to be there on social media. Consumers and customers want to be empowered by brands to be connected and be in the know. And social media is where they turn to for that connection and brand engagement. Social is where today's consumer gets informed and inspired. A website is no longer enough, and on your website you must include social sharing buttons and ensure that web content is always shared on social platforms that you are on. Social media interaction is key – you really cannot engage and interact on your website with your audience as you can on social. Make this your key channel and be relevant. With today's social "buy buttons" social has become a marketplace. But it's not about just selling. Move from Selling to building Relationships – this is what will end up giving you a far more robust presence online. One that meets and engages today's audience. Your brand's content marketing needs to be both relevant and engaging. That content, that information needs to be in the here and now. It needs to be current, always-on and outstanding to rise above the rest. Brands need to realize that one size does not fit all. The campaign is traditional. The TV spot is losing its impact. Localization is really becoming important. And personalization of brand message is what is cutting through. All these factors are critical to help transform your digital marketing. Great post. I would like to add that being there in Search results really helps to being there right there and right then. Search is key. So both SEO and SEM is important. Being there in the moment is what Google calls 'micro moments'. This post helps us to take advantage of those moments. It was such a valuable information. Thank you for sharing.